Sarah Naisambu and her husband, Ishmael, hold their daughter, Tabitha, as Joyce Njunukha looks on. Photo by A. Gichigi, MCSP. Ndengelwa, Kenya—Sarah Naisambu was depressed. After experiencing two miscarriages, the young mother blamed herself for not seeking out antenatal care (ANC) services early in both pregnancies—thereby missing out on comprehensive health services and support tailored to meet the needs of expectant mothers, including prevention, diagnosis and treatment of malaria. Living in Bungoma County, an area with high malaria transmission and poor pregnancy outcomes, Naisambu had sought out ANC during her first pregnancy. She attended ANC services early on and received all prescribed doses of antimalarial tablets, as well as information on the importance of using a bed net to prevent malaria in pregnancy. She delivered a healthy baby boy in May 2013. Since then, however, she had lost two pregnancies. Both times, her friends dissuaded her from attending ANC, she said, and now she realizes that her friends gave her bad advice. “I let my friends’ influence get the best of me and [I] ignored a nurse’s advice on early ANC attendance. And as I slipped deep into depression, I could not help but regret my mistakes,” Naisambu said. Hope came knocking on Naisambu’s door in the form of Joyce Njunukha, the Community Health Volunteer (CHV) in Ndengelwa village who visits 100 families every month to share messages on the prevention of malaria in pregnancy, importance of early and regular ANC visits, use of mosquito nets and taking antimalarial tablets. Njunukha visited Naisambu’s home and initiated a discussion on safe pregnancy. 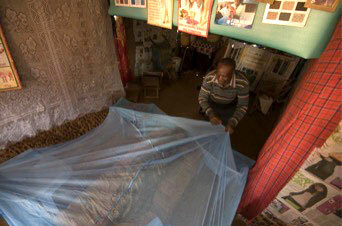 A CHV demonstrates a method to hang a mosquito net over a bed by supporting it with chairs. Photo by A. Gichigi, MCSP. “After I learned about her woes, I began counseling her and discussing the importance of attending ANC regularly. Sarah and her husband were at a low point and they agreed to follow my guidance and seek ANC [when they became pregnant again],” said Njunukha. 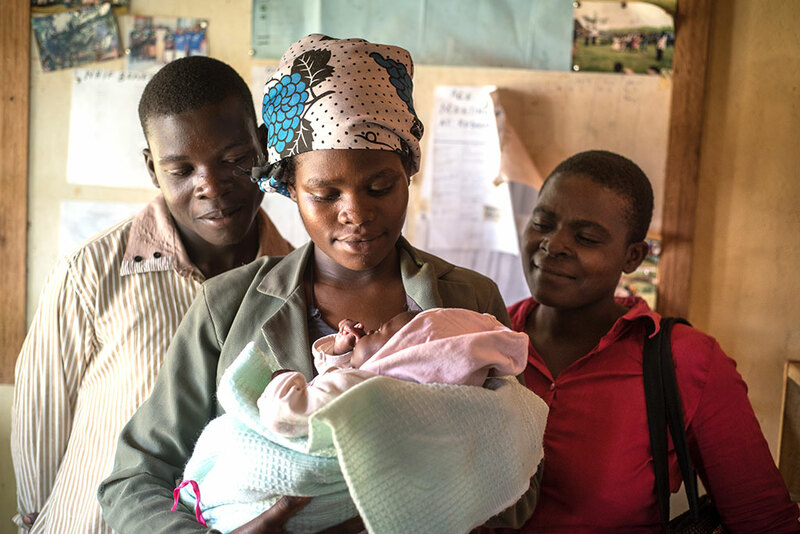 Njunukha is among the 2,522 CHVs in Bungoma County who received intense training in safe pregnancy last year through the United States Agency for International Development’s flagship Maternal and Child Survival Program (MCSP), which is led by Jhpiego. In partnership with the government of Kenya, MCSP is working with members of the Bungoma Health Management Team to fight malaria in pregnancy by preparing these health volunteers to educate their communities on the importance of early and regular ANC visits, the effects of malaria in pregnancy and how to prevent this infection. In 2015, Naisambu conceived her fourth child and, following Njunukha’s advice, started attending ANC services at the end of her second month of pregnancy. “During the pregnancy, I adhered to every advice I was given by Joyce. I took three doses of [antimalarial tablets] and also received tetanus vaccine and blood builder [iron and folic acid supplements],” says the 20-year-old mother. In January of this year, Naisambu gave birth to a healthy baby girl, Tabitha. Dr. Augustine Ngindu, MCSP’s Technical Advisor in Nairobi, said it’s critical that women are identified and counseled early in their pregnancies to start attending ANC services to prevent disease and death. “Malaria in pregnancy causes anemia to the mother, and low birth weight or stillbirth. Our aim is to avert all these effects by ensuring our mothers receive antimalarial tablets starting early in the second semester,” Ngindu said. According to Alfred Nyongesa, Bungoma County Community Strategy Focal Person, CHVs have played a major role in delivering messages about the prevention of malaria in pregnancy and improved pregnancy outcomes. “Malaria is the leading cause of illness and deaths in Bungoma County. MCSP has played a crucial role in ensuring we fight malaria effectively especially during pregnancy. From all these messages on various interventions, the community has learned how to take responsibility [for] their own health,” he said. Bungoma County is among the first four out of 14 counties to use CHVs to actively mobilize pregnant women to attend ANC. MCSP will support the Ministry of Health in Kenya to roll out this strategy in the other counties soon. While MCSP’s focus in Bungoma County is prevention, diagnosis and treatment of malaria in pregnancy—offered to women through a comprehensive package of ANC services—the global flagship program has a broader mission. MCSP has partnered with governments in 22 countries to improve health outcomes for families and support programming in: maternal, newborn and child health; immunization; family planning and reproductive health; nutrition; health systems strengthening; water, sanitation and hygiene; and malaria. Malaria interventions include integrated community case management and community involvement, addressing comprehensive malaria prevention and case management. Through her participation in MCSP-supported ANC, Naisambu learned about the importance of skilled birth attendance, exclusive breastfeeding, continued breastfeeding of her baby girl and immunization. Following Tabitha’s birth, Naisambu and her husband attended family planning counseling, discussed healthy birth spacing and decided to adopt a long-term family planning method. They also committed to ensuring that Tabitha receives all childhood immunizations.